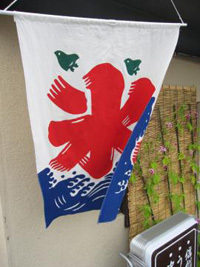 If you're in Japan, look for this or a similar flag to find a kakigori shop. The psychopathic heat with humidy continues here in Tokyo — today was 36°C or roughly 97°F. Meanwhile, the meteorologists are saying the heat in Japan might last until the end of October. Crazy! So how can you survive? One of the smarter solutions — besides lots of water, neck coolers, air conditioners and a trip to Antarctica — is snacking on some refreshing shaved ice, called kakigori in Japanese. Kakigori (かき氷) is a traditional Japanese dessert, a type of ice cream, made in a very simple manner. It consists of crushed (or shaved) ice, covered with syrup of various flavors, typically strawberry, cherry, lemon, green tea, grape, melon and sweet plum. This refreshing dessert, common also in other East Asian countries, is sold virtually everywhere in Japan during summer months. Some shops serve it with sweet bean paste which is often used as an ingredient in other desserts as well. In supermarkets, you can find it already flavored and packaged like ice cream, sometimes with added fruits. Japanese are always trying to come up with new varieties of kakigori.